Stewarding team contribute to the smooth running of the weekend and help to provide the public face of the festival. They are often the first people that festivalgoers meet when they arrive onsite, so good stewards have a really important part to play. 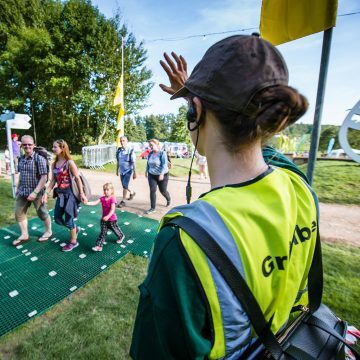 Stewards are often the first people that festivalgoers will meet when they arrive at Greenbelt, and also the people who keep them safe throughout the weekend, so this is a very important role. • ensure the safe running of the festival village, including both venues and outdoor areas. • assist with the opening and closing of venues, counting people in and out, managing queues and ensuring safe running of the inside of venues. As with all Stewards, you will receive job-specific training before the festival begins, and will be briefed at the start of each shift by your team leaders. Volunteers are required to complete two shifts totalling seven hours per day of the festival – between 7.30 am and 1.00 am. The nature of the role could mean you will spend much of your shift on your feet. Festival stewards are permitted on site from the Wednesday before the festival, after mid-day, so please do not try to turn up earlier. Also, remember that any others in your group who are not volunteers will be restricted to stay in the campsite until the start of the festival on Friday. Access to other areas of the festival site will not be permitted. On arrival, we will need to know names and numbers so that correct passes can be issued if needed. If you have any questions, please e-mail the stewarding address. Training sessions are for all stewards and must be attended. If you have not been to Greenbelt before as a steward you will also need to attend the basic stewards training. The sessions will take part before the Festival opens at various times on Thursday and Friday. They will include important information about the emergency services on site. in addition, each stewarding area will have its own briefing sessions. The briefing sessions must be attended by all stewards.